Well, hello stranger. It has been almost two years to the day since I lasted blogged. When I started Beer League I did so with great intentions and ambition. Then life happened and blogging took a back seat. But, I’m back! I’m excited to write again. I’m also excited to do some easier blog-type stuff. Like what? 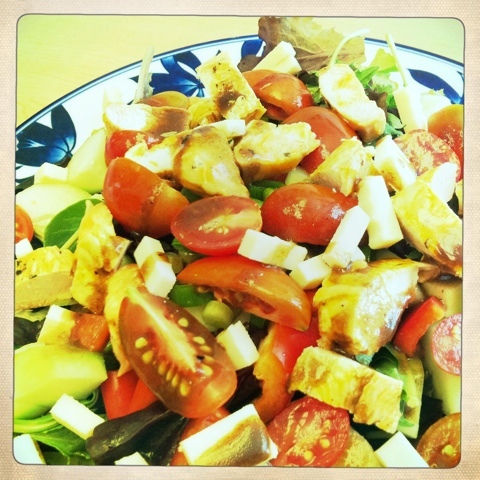 Well, like this post, which is a picture of my lunch: a very tasty salad made with tomatoes and cucumber from my garden. I’m not going to promise anything specific with this blog (which is what I did when I started and I ended up painting myself into a corner). I’m just going to write and post about stuff i want to share when I feel like it.